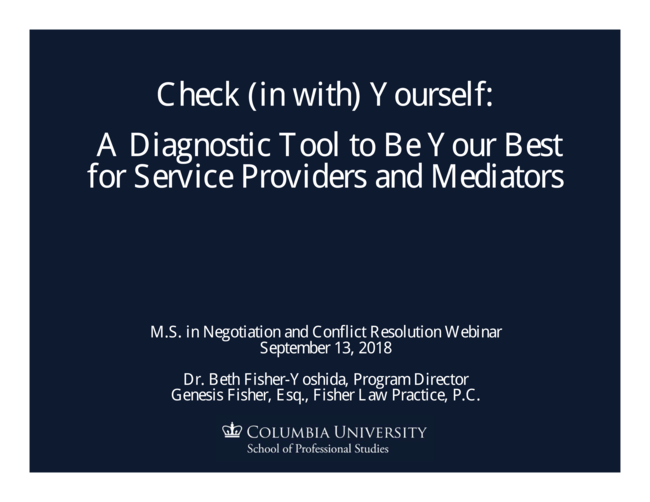 Webinar: Check in with Yourself - Fisher Law Practice, P.C. In addition to technical skills, practitioners in the field of negotiation, mediation and conflict resolution also need to manage their own emotions and stress related to their work. In this webinar you will learn more about how to perform self-assessments that will enable you to stay at the top of your game and serve your clients well. The webinar will be available online soon. Click here to watch. Genesis Fisher is Founder and Principal Attorney of Fisher Law Practice, P.C., which provides on-site conflict resolution to help businesses deal with tough issues and keep employees focused on work, not office disputes. Allegations of discrimination (race, gender, LGBTQ) or sexual misconduct can tear teams apart. Through mediation, one-on-one coaching, and conflict resolution training, she gets people talking so they can share their frustrations, address differences and repair trust. She is also an experienced criminal defense attorney. Fisher is on the Board of Directors at the Association for Conflict Resolution, Greater New York, and an adjunct professor at New York Law School. Genesis Fisher, Esq., Founder, Fisher Law Practice, P.C.